Perry Jackson – Not too much XBLA but I did get to play Retro City Rampage at a Playstation event this week. It was on a Vita but it’ll be an engrossing, crazy experience on any platform. Matt Liparota – A crazy week for me, what with an upcoming move and my girlfriend’s college graduation; in my spare time, though, I managed to dig a little more into Minecraft (Get it? Dig? Minecraft? Mine? Oh, nobody understands me). Looking forward to a bit of a lighter week coming up, hopefully with lots of gaming involved ([easyazon-link asin=”B0022TNO7S” locale=”us”]Max Payne 3[/easyazon-link]anyone?). Nathan Bowring – Can’t talk, I’ve got a ton of obsidian to mine in Minecraft but I can’t find any diamonds! James Heiger – Its been a really slow week of gaming for me. I am still chipping away at Trials Evolution. I also fired up Pinball FX2 for a bit too. Nick Santangelo – I played a little bit of Awesomenauts and a whole lot of [easyazon-link asin=”B002BSA20M” locale=”us”]Halo Reach[/easyazon-link]. It’s nice that 343 is putting more appropriate credit rewards for completing challenges in and focusing the challenges more on matchmaking modes, which I Bungie probably should have done from the start. Still, the progress bar towards Legend moves absurdly slow, so I’ll probably still be ranked Hero when Halo 4 hits no matter how much I play the game between now and then. Anyhow, I also played some[easyazon-link asin=”B007RNWUC4″ locale=”us”]Xenoblade Chronicles[/easyazon-link], but I’m making slow progress in it. The “good” news is that the retail release schedule for the next several months is a barren wasteland, so there won’t be much to distract me from it. John Laster – Awesome. Awesome. Awesomenauts! Ross Adams – It was a fairly regular week for games and then, Minecraft. Ben Fisher – Still rolling along on Prototype 2. Steve Melton – Picked up [easyazon-link asin=”B003O6E986″ locale=”us”]Forza Motorsport 4[/easyazon-link] for myself and Cars 2 (the video game) for my daughter and myself. Who knew that a movie-franchise game would be the perfect answer to an Xbox version of Mario Kart? Cars 2 is awesome. Christine Mitchell – Well I wasn’t playing Fez that’s for sure, since my game save corrupted (sob!). Instead I settled for more Fable Heroes and a wee bit of [easyazon-link asin=”B0050SYYEK” locale=”us”]Dance Central 2[/easyazon-link] while I wait for the patch. 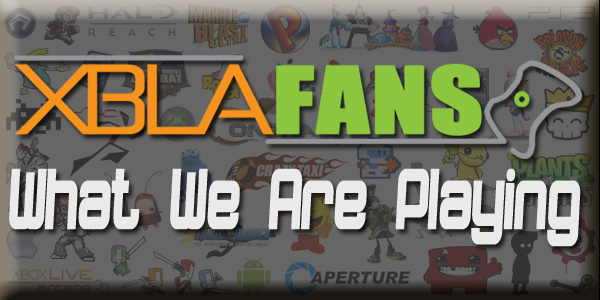 Todd Schlickbernd -I’ve been all up in and around XBLA this past week. I’ve now got over 30 hours of Awesomenauts in and over 100 games, and proud of it. A few games a day has been tons of fun. I also played some Trials Evolution with friends over the past week and Castle Crashers as well. Lastly, I ended up playing waaay too much Minecraft. Never wanted it for PC, wasn’t going to pay for it on Xbox, then I got it for free; I’ve never had a game try so hard to get played. Mark Seymour – Chowed down on my words and spent the last few days building sky-railways and portals into the bowels of hell in Minecraft. Also preparing myself for the almighty punch to the face that will herald Max Payne’s long-awaited return. It has been far, far too long. No lack of choice on XBLA at the moment. What’s been tickling your fancy over the last seven days?